I’ve never skied before. So when Gapi, my EVS mentor, offered me to join him on one small ski-resort “Stari Vrh nad Škofjo Loko” I hesitated for a while. But now I’m very happy that I agreed. To my surprise I liked skiing and that posh-winter atmosphere which we had in Stari Vrh. The hardest thing in skiing is to put on ski shoes, especially if they are a bit small for you. I felt like those Cinderella’s sisters while I was trying to put shoes on with Gapi’s help. Then it was terrible feeling to walk in them but the good thing in skiing is that you forget all pain when you try to ski. Congratulations! 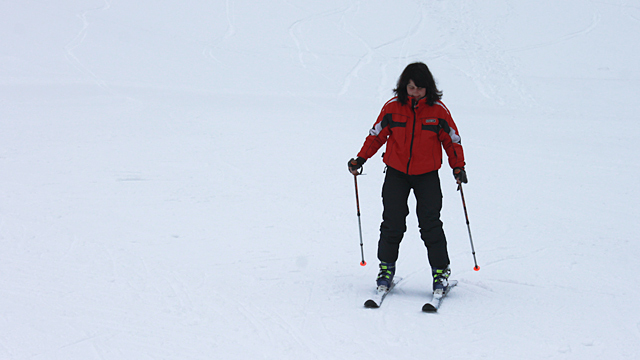 Skiing – is a one of my favorite kinds of winter vacation!